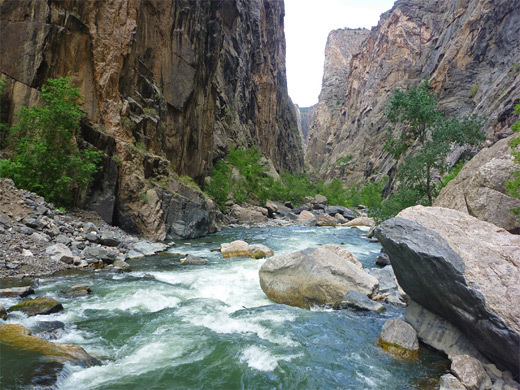 There are six hiking routes to the Gunnison River in Black Canyon of the Gunnison National Park, three on each rim, and Long Draw (also known as Devil's Slide) is about the steepest, dropping 1,800 feet in just over half a mile; a constant gradient of 40 degrees. 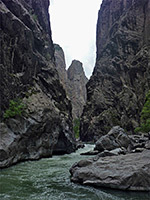 The draw is a typical Gunnison River side canyon, being very short and steep, since the tiny, seasonal tributary streams have limited erosive power, especially when confronted by the very hard rocks that enclose the main gorge. 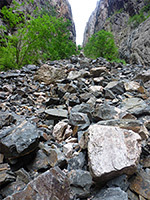 The route is mostly over boulders, some small and loose, others large and firmly anchored, so with care the hike is not too difficult - although the NPS gives the average time for the descent as 1.5 hours (and three hours for the climb back up), the river can be reached in as little as 30 minutes. The views are of course little changing on the way down, but the cliffs open out at the lower end of the draw to reveal a particularly impressive section of Black Canyon, just downstream from The Narrows, the most enclosed channel, where the walls at water level are vertical and only 30 feet apart. In the other direction, the river also soon flows through a sheer rock passageway, so only a short stretch (500 feet) of the shoreline is accessible, and there is certainly no way to cross the river because the waters flow very strongly all year. 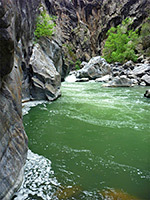 The combination of powerful river and such a deep, narrow canyon is unique in the Southwest, and the Long Draw route accesses the most spectacular part. 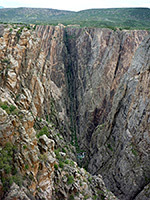 Black Canyon of the Gunnison National Park map. 15 views along the route, and a short video of the Gunnison River. Panorama of the Gunnson River. Full screen version (23 mb). Parking for Long Draw is at Balanced Rock View on the north rim of Black Canyon, 1.2 miles from the ranger station. This overlook is one of six on this side of the canyon and has partial views of the draw just to the south, though a much better perspective is from Rock Point, directly opposite on the south rim (83 miles away by road). From the small parking area, the head of Long Draw is 0.3 miles away, reached by walking along the road. A small sign details the regulations, namely no dogs, no fires and backcountry permits required; these are free, obtainable from the ranger station, via a self-registration system if unstaffed. The sign gives the name of the drainage as Long Gulch, but Long Draw seems to be more used. The route down Long Draw is quick to describe. From the road, a grassy slope leads to a shady grove of box elder trees, already enclosed by vertical cliffs, which open out slightly just beyond, and for the rest of way the vegetation is limited. There are several short ledges to negotiate in the upper canyon, none too demanding, then the majority of the hike encounters only boulders. Faint paths are visible in a few places, but their surface tends to be slippy due to loose stones, so it is usually easiest to climb down using the larger, firmer boulders as footholds. 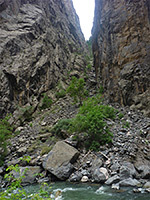 The draw becomes slightly less steep and more overgrown towards the end (including some poison ivy), as it meets the Gunnison River, right opposite the equally steep, south rim drainage of Echo Canyon, which contains some taller drops and so is not suitable for hiking. The rocks in Long Draw are dark in color - grey, brown and black, and quite varied in texture, weathered and partly covered by lichen. Shiny flecks of mica and pyrite catch the eye, and the sun, though for most of the day the ravine is shaded. The greenish river waters flow most powerfully, past boulders, tiny bays and bare rock walls, and the narrowest section of the whole gorge is just 100 feet upstream.